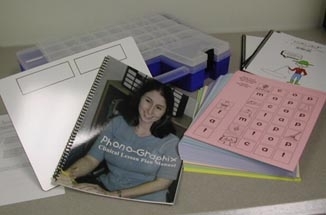 The clinical lesson plan manual has a full color laminated cover, twenty-one new pages of teacher training information, and the lesson pages are color coded to the level of instruction. The stories are bound in three book sets SP, CH and FF. Each has a full color laminated cover. 600-piece manipulative sets are fully laminated and color coded. The kit also includes the Word Work classroom manual not pictured here and a carrying case. NOTE: This kit is required for third-party Phono-Graphix Certification Trainings (it is included with the online Certification Training).